This is the ugliest Lamborghini Urus we’ve seen yet. Celebrities often love customizing their exotic cars to make them stand out from the crowd. Jamie Foxx’s golden Bugatti Veyron immediately springs to mind. Now, Kanye West has pimped up his Lamborghini Urus, and it’s suitably over the top. Cars are often the embodiment of the owner's personality, after all. The design of the Urus is an acquired taste, but it looks undeniably aggressive. Kanye West’s custom Urus, on the other hand, looks utterly hideous. The rap artist recently took delivery of his custom Urus in LA fitted with a cream-colored matte vinyl wrap designed by California-based specialists Just A Wrap. The suspension has been lowered and the Urus sits on a set of comically oversized wheels made by Boyd Coddington designed by Kanye West himself. Things get even worse when you step inside the cabin. West opted for blue and black leather upholstery along with silver trim that hurts our eyes. 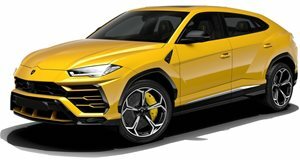 The result is the ugliest Lamborghini Urus we’ve seen so far. We also wouldn’t like to guess how much the rap star would have paid for these modifications on top of the SUV’s $200,000-starting price. Other aftermarket specialists such as TopCar have also previewed new body kits that will be available for the Urus, so we’ll no doubt start to see further customized version of the Urus as more examples get delivered to customers. As far as we’re aware, Kanye West hasn’t made any modifications to the powertrain. As standard, the Urus is powered by a twin-turbo 4.0-liter V8 that produces 641 hp and 627 lb-ft of torque. Power is sent to all four wheels through an eight-speed automatic gearbox. 0-62 mph takes 3.6 seconds before the Urus tops out at just under 190 mph. This earned it the title of the fastest SUV in the world until it was beaten by the Bentley Bentayga Speed last month, which has a top speed of 190 mph beating the Urus by 0.5 mph.